SPOILER ALERT: If you do not wish details from the plot of "Mad Men" Season 5, Episode 3, please stop reading now. As always, HuffPost TV's full recap of the show will be published later this evening. Betty (January Jones) returned in the third episode (the premiere was a double episode) of the long-awaited fifth season and Mrs. Francis (nee Draper) has gained a good amount of weight. Jones herself was pregnant during the filming of the fifth season of the show, and showrunner Matthew Weiner told HuffPost TV her character won't figure prominently this season. Weiner didn't give the audience much time to come to terms with the change. 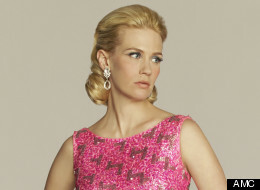 A mere couple of scenes after her first Season 5 appearance, viewers find out that Betty has a medical issue: a lump on her thyroid. Though she reaches out to Don to let him know that she was facing a potentially serious health issue (ruining his plans to go to Fire Island with the bathing suit-clad new Mrs. Draper, Megan), she eventually finds out that the tumor is benign. Her reaction to the good news? "I feel like I just got off a boat from China."